SKU: MXCA1B001T4001FIPS. Categories: DataLocker External Hard Drives, IronKey. An ergonomic finger swipe for identification, combined with strong password and CAC/PIV authentication, challenges unauthorized users. And a high-strength aluminum enclosure resists physical break-ins and lets you recognize immediately any attempt to compromise the case. 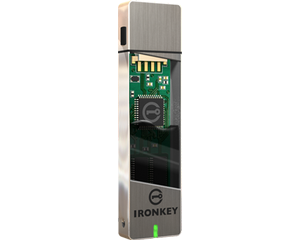 AES-256 hardware encryption makes the IronKey H200 Biometric External Hard Drive perfect for storage of the most sensitive data.